Put your kids to bed - Grab a hot cup of your favorite beverage - Put on your P.J. 's - Surf over to channel www.247moms.com on your computer and join us. We all dream of our kids getting a Shot at being accepted for who they are in life. I stumbled across this video for the 2nd time now and once again was brought to tears. Tears because I saw my own child in this video, my own puzzle boy who day in and day out attends school, plays video games, builds legos, rides a bike goes to Cub Scouts just like every other little boy his age except Caleb does most of it alone. My observations made me realize the lack of training our schools give to both teachers and students on inclusion integration. I observed my child having no one to sit with to eat his lunch. I was given a list of children to chaperon that my child had no idea who they were. I was given 2 additional children besides my own which meant a group of 3. We all no what happens in a group of 3 especially when one is a puzzle child. I observed a child playfully hitting my child in the minds of others. But, this mom knows it was not playful it was the classic picking on a child who doesn't understand when someone is being mean to him. All of these observations have brought a slew of questions to us as a family and our research has begun once again as to the best placement for Caleb to get a shot. What we dream of is our little boy getting a shot in life just as you see in this video a team that accepts and understands a puzzle boy. Teachers, coaches, classmates and parents who are willing to give him a shot. Who doesn’t enjoy a good love story? From Romeo and Juliet to “When Harry Met Sally,” love stories have made us laugh and cry for centuries. There is a door in everyone’s heart that opens to the notion of true love. Chicken Soup for the Soul: True Love is a fun, new read about dating, romance, love and marriage, guaranteed to inspire a renewed search for that special someone, or open your heart a little more to the one you already love. Read fascinating stories about how couples met, when “they knew,” incredible good and bad dates, imaginative proposals, wedding day adventures, second chances, the ones that got away, and all the other ups and downs that come hand-in-hand with true love, including great examples of how to keep relationships strong. 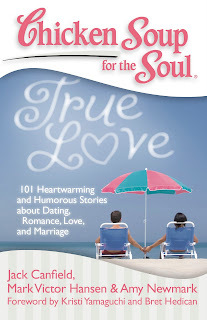 From the beloved, bestselling Chicken Soup for the Soul brand, Chicken Soup for the Soul: True Love is the latest addition to their popular collection of love stories, featuring completely new tales from people of all walks of life. WIN: 24/7 MOMS and Chicken Soup for the soul are giving away one copy of this book. US entries only and one entry per person. Winner will be chosen on February 14, 2010. *We received a complimentary copy of this book for review no financial compensation was received. Fillings for sandwich - you can choose anything from peanut butter to lunch meats. 2. Create a sandwich using the heart shaped bread. Create heart shaped cheese slices and serve with crackers. Use a small heart shaped cookie cutter to cut out heart shapes on pre-sliced cheese. Also try cutting lunch meat into heart shapes. POUR milk into medium bowl. Add dry pudding mix. Beat with wire whisk 1 min. Add to gelatin; stir until well blended. Pour into 13x9-inch pan. REFRIGERATE 3 hours or until firm. Dip bottom of pan in warm water 15 sec. Cut into 24 decorative shapes using 2-inch heart-shaped cookie cutters, being careful to cut all the way through gelatin to bottom of pan. Lift JIGGLERS® from pan. Store in tightly covered container in refrigerator. Slice up strawberries and Bananas into heart shapes. Don't forget the Valentine napkins and candy treats. 2. Place heart shaped cookie cutter on top of bagel, fill with 1 -2 tbs cream cheese and spread into cookie cutter. remove cookie cutter. You should now have a heart shape of cream cheese. 3. Remove stems from strawberries, Slice whole strawberries in half , cut a V at top of berry to create a heart looking berry. Now place your heart shaped strawberry in the middle of the cream cheese. Crack the eggs into a glass mixing bowl and beat them until they a light yellow color. Add the milk to the eggs and salt and pepper. Whisk mixture fro about 2-3 minutes . Or you can use an electric beater or stand mixer with the whisk attachment. Whatever device you use, you're trying to beat as much air as possible into the eggs. Turn off heat and take heart shaped cookie cutters of various sizes and cut-out heart shapes of your omelet...My version of Scrambled eggs. 1. Using a 3 1/2" Heart cookie cutter cut out heart shapes from each bread slice. 2. Whisk milk, eggs and almond extract in a shallow dish until to make your egg mixture. 4. Melt 1 tablespoon butter in large skillet or hot griddle; Places slices of bread ( hearts) in pan or on griddle and cook over medium heat about 3 minutes on each side or until golden. Transfer to a oven safe plate or dish , and keep warm in oven at 175 degrees..
Sprinkle heart French toast with powdered sugar and garnish with strawberries . Melt remaining morsels in small, uncovered, microwave-safe bowl on MEDIUM-HIGH (70%) power for 30 seconds; STIR. Morsels may retain some of their original shape. If necessary, microwave at additional 10 to 15-second intervals, stirring just until morsels are melted. Stir in powdered sugar and milk to make a stiff glaze. Drizzle over cinnamon rolls. DogToids Breath Mints – These delectable doggie treats are made of human-grade ingredients with natural flavors including beef, liver and fish that dogs love. They also include parsley to help freshen breath. CatToids Breath Mints – Cats will crave the tasty flavor combination of CatToids Breath Mints, also made with human-grade ingredients and natural flavors such as salmon and liver. They include taurine (an amino acid essential for a cat’s health) and parsley to help freshen breath. Both DogToids and CatToids Breath Mints come in stylish tins that slide easily into a pocket or glove box – ideal for dogs or cats on the go. They are made in the U.S.A. and are available now for a suggested retail price of $4.99 at retailers nationwide. *We received a complimentary PetSmart toys for review no financial compensation was received. Deal Of The Day : Get your kids excited every morning about breakfast with Cream of Wheat Hot Cereal. Get a FREE sample of the new Sponge Bob Square pants hot cereal from Cream of Wheat. Click here to get you freebie sample. This Valentine’s Day make sure to show your four-legged friend some extra love. 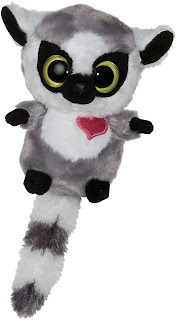 PetSmart’s Valentine’s Giveaway includes plush and loofa dog toys featuring hearts and sweet messages to entertain you dog. Internal squeakers in the loofa and conversation heart toys and kissing sounds when you squeeze the lip toy add to the Valentine’s Day fun! · LOOFA 12" VALENTINES CANVAS: Valentines loofa dogs are adorned with pink conversation hearts and an internal squeaker for hours of fun on Valentine’s Day or any day. 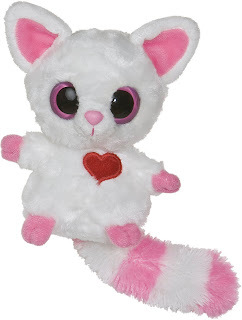 · LOOFA 6" VALENTINES I LOVE YOU: This mini loofa dog toy is covered in sweet messages vand hearts and has a squeaker in his tummy to entice your pup to toss, tug and chase for hours. 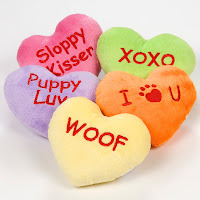 · PLUSH CONVERSATION HEARTS: Watch how excited your Valentine’s pup gets when he "feasts" his eyes on this plush replica of a tasty treat with squeaker insi de. · PLUSH LIP TOY: This plush toy makes kissing sounds when you squeeze it to entertain your Valentine’s pup. Dogs love the shape of these boldly colored toys and there's a squeaker for added fun. 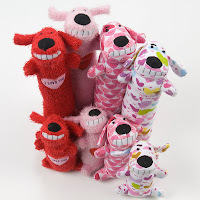 WIN: 24/7 MOMS and PetSmart are giving one one set of Valentine day dog toys. US entries only and one entry per person. Winner will be chosen on February 7, 2010. Q: What is your favorite type of cracker? 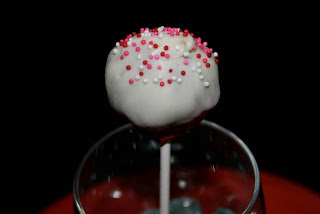 Everything went RED last week on the 24/7 MOMS Live webcast...a night full of SIMPLE Valentines treats, celebrations and ideas to help us as MOMS create memories for our families. Be sure to Join us next Tuesday Night for "Let's ORGANIZE It" 7pm PST and 9pm PST right here at www.247moms.com. Surprise your kids when they wake up on Valentines day with a Pop Art Toaster. The Pop Art Toaster is a retro style, two slice toaster in plastic or chrome. Removable and interchangeable image stencil plates toast images onto one side of your toasted products - the back side is fully toasted. 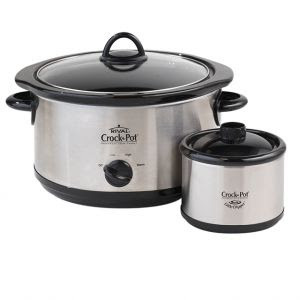 It can be used with all breads, frozen pancakes, flat bagels, toaster pastries, and even hamburger buns. For everyday toasting without images, simply remove the stencil plates for toasting bagels, waffles, english muffins, frozen french toast or plain bread. The toasters have 7 heat settings, a frozen button for defrosting, a reheat button, a cancel button, a removable crumb tray and a plate removal hook. The Pop Art Toasters comes in 10 styles from Disney Princesses, Mickey Mouse to even a Love struck one with perfect valentines designs. Create great breakfast morning memories with your kids with a Pop Art Toaster. You can purchase in retail stores or online at the Pop Art Toaster store. DEAL - The Disney Pop Art Toaster are currently on sale for $19.99 at the Pop Art Toaster online store. Stop by the Pop Art Toaster online Store and check out their selection and tell us your favorite toaster then complete the steps below to enter for your chance to WIN. 2. If you are already a subscriber just leave a comment that you are a subscriber along with your email address and favorite Pop Art Toaster. *We received complimentary Pop Art Toaster for review no financial compensation was received. Thanks to 24/7 MOMS Team member Amy who shared these 3 great Healthy Breakfast option recipes with us. You can vary the additions to this recipe for breakfast burritos. Add onions or frozen hash brown potatoes, omit the salsa, try using different types of cheese or flavored tortillas. The possibilities are endless! Toss your fruit into the blender. Add the yogurt and then the apple juice for a little sweetness. If you're using fresh fruit (not frozen), add a few ice cubes as well. Now it's time to bounce! Switch on the blender and watch all of that fruit bounce around. 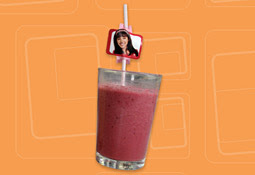 Pour each smoothie into a tall glass and finish off with a straw. From paper crafting kits to vinyl lettering, Treasury of Memories is the place to find it! 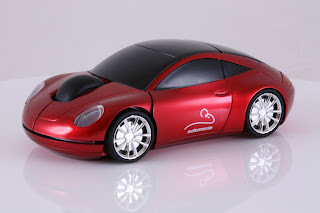 Motormouse is a unique digital, wireless computer mouse inspired by the Porsche 911. It comes in three colors, metallic red, silver or black. Superbly crafted with exquisite detail it has left and right buttons plus a scroll wheel, authentic headlights, chrome alloy wheels and real tires. It is suitable for all computers including Macs and has the world's smallest 24G receiver. No software is required, just plug it in and take Motormouse for a test drive. Avant Garde - means "advance guard" or "vanguard". The adjective form is used in the English language to refer to people or works that are experimental or innovative, particularly with respect to art, culture and politics. Avant Garde represents a pushing back of boundaries of what is accepted as "the norm" or the status quo primarily in the cultural realm. Avant Garde Gifts LLC was established to be a leader, be innovative and push back boundaries both from a design and technology viewpoint. The company is based on Marco Island, Florida and strives to bring you Luxury and Executive gifts and gadgets, all available through the internet, together with outstanding customer service. The latest collection is the 'motor mouse' and is an exciting range of executive gadgets, launching with the first model based on an iconic sports car. My name is Laura Miranti and I have four great kids- Slone, Marren, Lucia, Lorén and a wonderful husband, Chris. I spend my days juggling kids’ activities, work responsibilities, household duties, and an occasion workout. I love spending time with my family, so I decided that I would stay home with the kids after my daughter, Lucia, was born in January 2006. As a CPA, for the next 3 years I was able to telecommute doing accounting work for a worldwide company based here in The Woodlands, Texas. Then in Feb. 2009 I decided to focus on Board Book Albums full time. The Pix™ board book photo album has sturdy pages, into which photos can be inserted from an opening in the top of the pages. Unlike traditional photo albums, our albums have thick rigid pages that are perfect for little kids to handle (like the chunky little kids board books). Notches have been added to the page edges to facilitate page turning. Each white photo album is 7" x 7" with 10 white pages inside the cover. Each album holds 20 4" x 6" photos and has a cover photo frame that holds a slightly smaller photo (about 4" x 5", so you can just trim a 4" x 6" photo to fit). Each white Take Your Pix ™ board book album is blank with no lettering and comes with a removable baby photo in the cover frame. The solid white albums are perfect for wedding albums, scrapbooking and decorating yourself. Kids can have fun decorating their own books with stickers, stamps, or markers. Grandparents love to give and receive our albums as gifts! The white albums are also great for wedding showers gifts, bridesmaid’s gifts, and wedding reception favors. Aurora World Inc. (http://www.auroragift.com/) has announced to its retail customers worldwide 2010’s new festive and colorful Valentine’s merchandise. Topping the list is “YooHoo Greetings” which combines the two most popular selling Valentine’s Day items – a plush toy and greeting card. Showing its soft side, Aurora’s “I Wuv U” Bears and “U Make Me Wild” Monkeys are sure to tug at the heartstrings of your special someone. Pearls Before Swine’s cheeky Valentine editions, based on the world famous comic strip, round out Aurora’s product highlights for its Valentine’s catalog. Aurora World Inc. (Aurora) has grown to become a respected leader in the plush gift industry, thanks to its hallmarks of success producing large varieties of high quality, affordable plush. Aurora brings smiles to millions of kids of all ages around the world, from every walk of life. The company story begins in 1981 when it launched as Aurora Trading Inc., in Seoul, Korea. Over the next decade, Aurora quickly established itself as a leader in the industry with its celebrated designs, highlighted by quality and creativity. The products speak for themselves, and at the same time, the company developed an infrastructure and philosophy for which they are now well known -- exceptional customer service, phenomenal leadership and strong employee relations. yooHoo & Friends are based upon real animals from around the globe, some of which are endangered. YooHoo & Friends live in the virtual world Yootopia- visit them today at www.yoohoofriends.com to play games, raise YooHoos, and watch previews of the upcoming YooHoo & Friends animation series. Collect all the YooHoo & Friends today! From spotting the hottest jewelry trends to accessorizing today’s most photographed celebrities like Sienna Miller, Eva Longoria and Sheryl Crow, lia sophia is your go-to resource for winter style. As the world’s largest direct seller of fashion jewelry, lia sophia offers high-end fashion at affordable prices. In addition, the company offers jewelry lovers an opportunity to be fashionably charitable, as well. lia sophia’s Poetic necklace is this season’s gift that gives back. This gorgeous necklace is made of genuine mother-of-pearl and varying shades of genuine grey agate that flow gracefully from circular accents of polished silver. The necklace is made all the more special because with every purchase a portion of the proceeds benefits Dress for Success. Dress for Success is a non-profit organization that helps economically challenged women worldwide transition from unemployment to self-sufficiency. Dress for Success and lia sophia share a common goal of empowering women with lia sophia recently donating $3 million worth of jewelry to its long-time philanthropic partner. So this holiday, give the gift that gives back with a purchase of the Poetic necklace. When it comes to philanthropy, what matters is not how much you give, but that you give at all (The New York Times - November 12, 2009). In this economy, when mega- donations are down, the fact that individual efforts can have a positive cumulative effect is more significant than ever. So this season, consider the Poetic necklace as gift that can make a difference. The Poetic necklace and all of lia sophia’s exclusive designs are only available for purchase through a lia sophia advisor. To find one near you, visit http://www.liasophia.com/. The Velvet Crumb is an online cupcake boutique offering a modern spin on a timeless classic. Each item is made to order and customized to meet your individual themes and occasions. At The Velvet Crumb we use only the finest ingredients (many of which are organic) to help us create nostalgia you can taste! With over 20 flavors to choose from, we truly offer something for everyone. The Velvet Crumb is owner-operated, meaning every cupcake is made with passion and dedication. Located in Sonoma County, The Velvet Crumb is Wine Country’s premier cupcake gourmet. The Velvet Crumb offers cupcakes for a wide variety of occasions, from birthdays and weddings to corporate events and banquets! ...feeding the world one cupcake at a time! Q: If you had to move to an island and you could only take 10 things with you what would they be? What's the richest kind of air? Recent research says that 24/7 MOMS was named by MOMS as a Facebook favorite right along with Starbucks, Trader Joes, and Crayola. Kevin Burke of Lucid Marketing and Lisa Finn recently completed a study and report on marketing to moms on Facebook in which Kevin wrote a great article titled Facebook is Fertile ground and YES 24/7 MOMS got named in his article. You can read the entire article by clicking here. Be sure to leave a comment for Kevin that you are also a 24/7 MOMS Fan. Speaking of Facebook - Are you a Facebook Fan of 24/7 MOMS? if not join the MOMversation on Facebook as we daily travel the mom journey together a place we can ask questions, share ideas and tips with other moms.